SINGAPORE, 6th December 2018 – EDMI Limited, a global smart metering solutions leader, will celebrate 40 years of operation on 7th December 2018. Today, its customers include some of the world’s largest energy companies, including distribution network operators, utilities and service providers, across 100 countries with over 11 million metering points and systems deployed globally. Born in Brisbane Australia, EDMI was originally established as “EDMQ” (Electronic Design and Manufacturing Queensland), in a small shed in 1978. It initially began life, not in metering, but as an engineering consultancy that delivered smart solutions for diverse projects such as irrigation systems, digital scoreboards, and consumer energy use monitors. It became EDMI (Electronic Design Manufacturing International) in 1982, and soon after found a niche in developing innovative solutions in the metering world. In 1990, EDMI introduced its first smart electricity meter (the Mk1), at a time where no similar grid interconnect meter existed in the market. The Mk2 meter followed in 1994; and the Mk3 meter released in 1996 became a transmission mainstay for many years. Now in its 40th year, EDMI offers a range of end to end metering solutions with smart electricity and gas meters, across transmission, commercial and industrial, residential and sub-metering markets. Along with meters, it develops communication devices and software for meter data management (MDMS), head end solutions and data analytic systems. EDMI’s global headquarters is in Singapore, with ~1500 employees across 14 countries, and owned by leading Japanese smart metering company Osaki Electric. “Celebrating 40 years is testament to our commitment to developing innovative products collaboratively which our customers can rely on, and we thank them for their enduring support,” said Mr. How New Seng, Chief Executive Officer at EDMI. “Continuing to leverage our heritage in providing quality smart metering products, we are now evolving to create solutions that will facilitate the transformation of the energy market as we shift to a cleaner, intelligent and distributed energy ecosystem; from smart grids, to smart cities and beyond,” he concluded. 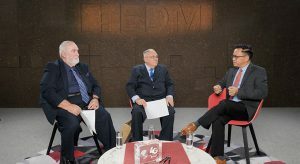 To commemorate and reflect on EDMI’s 40 years, Mr. How took the opportunity to meet with EDMI founders, Mr. John Flood and Mr. Neil Gibson, captured in a video interview. To watch this, click here.